Roundtable Discussion is a new feature of the site. This segment focuses on a series of sports issues involving the NBA, MLB, NFL, NHL, collegiate athletics and much more. In the fourth episode, myself, Sam Hengeli and Jerome Williams discuss this year’s NBA Playoffs. Steven Abramo: Let’s start off this discussion with what might be the biggest name in basketball this season: James Harden. The 28-year-old has undoubtedly carved out the best regular season of his career, averaging 30 points and nearly nine assists per game, shooting up to the top of the MVP charts while leading the Houston Rockets to the league’s best record (66-16). It’s quite evident that Houston has received the best out of Harden, but this can also be said for Chris Paul, Trevor Ariza, Clint Capela, and even Mike D’Antoni. In full, the Rockets enter these playoffs as the overwhelming favorites, behind their best roster since Hakeem Olajuwon in the mid-1990’s. With that, should we expect nothing less from a Finals appearance from them? Jerome Williams: Houston has had a great season by every measure. Besides Harden and Capela recording career years, the Rockets have received excellent production from Eric Gordon and Gerald Green. The only weaknesses that I see with this group are team rebounding, which is middle-of-the-pack in the league, and health. I think losing Luc Mbah a Moute (shoulder) hurts and Chris Paul (averaging about four fewer minutes per game than his career avg.) always seems to sustain some nagging injury. However, Houston can go about twelve players deep so they should be able to withstand any injury/production issues as long as it doesn’t happen to Harden. I fully expect Houston to be in the Western Conference Finals in an epic showdown against the Golden State Warriors, with the winner of that series hoisting the Larry O’Brien trophy. Sam Hengeli: Yes, I expect Houston to make the Finals this season. James Harden has been sensational, Chris Paul is in a situation he wants to be in, and Mike D’Antoni has turned the Rockets into a top defense, ranked 6th in Defensive Efficiency. One of the keys to the Rockets Finals aspirations, though, rests in the production of Eric Gordon. Gordon is entering the playoff with an ankle injury, but if he is fully healthy, his 18 points per game off-the-bench will be critical to winning the west. I’ll actually go a different route and say Paul has the most pressure to perform in the postseason. This is warranted because of the fact he has never reached the conference finals in his career. If Paul can breakthrough and make the Finals, the postseason failure label on CP3 will start peeling off. Now, if the Rockets fail to reach the Finals because of Paul’s performance, then that would be another stain on his legacy. Steven Abramo: Transitioning to another Western Conference power, let’s focus on the Warriors. As we all know, they’ve been nothing short of basketball’s perfection lately, appearing in the past three Finals; winning two championships. However, despite a wealth of talent, Golden State’s once impenetrable armor has revealed cracks this season. They enter the playoffs losing 10 of their last 16 and have shown no signs of fixing their leaky defense and sporadic bench. Of course, health is the key to Golden State’s success, and they will start the first round without its brightest star in Stephen Curry. How does Curry’s injury, as well as their recent issues, impact the Warriors playoff hopes moving forward? Jerome Williams: I think the Curry injury has a significant impact on the Warriors. Not only is he the best point guard in the NBA, but he is also the silent leader of this team. The Warriors have a very tough first-round matchup with the Spurs and odds are they win that series. Things will become tougher in the next round, and at this point, no one knows how effective Curry will be (especially if they match up with OKC). Golden State leads the league in scoring and three-point percentage so the offense won’t be a problem even with a limited Curry. I think that defensively if they make enough plays (8th in steals and 1st in blocks), they can beat anyone. Sam Hengeli: The issues the Warriors have involving Curry’s health is enormous. No one realizes this, but it’s tough to make it to four straight Finals. Yes, LeBron James has made it there seven consecutive years, but Golden State is finally showing fatigue. Further, all four of Golden State’s stars have been injured during this season, and let me give you something that we haven’t really paid attention too: the Warriors are getting old. Andre Iguodala is 34. David West is 37. Swaggy P (Nick Young) is 32. Shaun Livingston, who has one of the worst knees in the NBA, is 32, and JaVale McGhee is 30. The injury to Patrick McCaw takes away some youth off the bench for the Warriors, but that will still hurt them moving forward. Obviously, Golden State is still the favorite by many experts to make the Finals based solely on their past performance. However, this is the most flawed Warriors team out of the last four years. Their road to the Finals is going to be the most arduous since the 2016 playoffs. 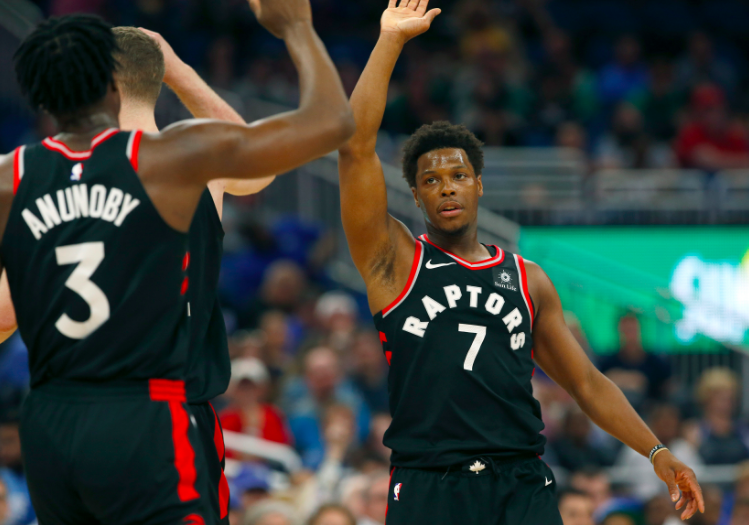 Steven Abramo: Moving onto the Eastern Conference, the Toronto Raptors have been the talk of the NBA this year. DeMar DeRozan is playing his best ball, and Dwane Casey is a changed coach. The Raptors are the conference’s top seed, but in years past, we’ve witnessed Toronto fail to live up to their potential in the postseason, reaching the conference finals only once in the past five years. Does this pattern continue once again? Jerome Williams: Toronto has enjoyed an outstanding season. Having the #1 seed helps immensely because they’re tied for the best home record in the NBA (34-7). But there’s a player who still resides in the East named LeBron James, and unfortunately for the Raptors (and the rest of the conference), the road to the Finals goes through him. Sam Hengeli: Yes, the pattern will continue again this year. The Raptors will get past Washington, that’s a given, but Toronto’s road ends in the conference semis to LeBron. Toronto has yet to prove that they can match Cleveland in a playoff series, much less away from the Air Canada Center. Even though the Cavs might post the least talented team LeBron has had since his first stint in Cleveland, they have shown the ability to win big games when need be. The Raptors have the most pressure to perform out of any team in this year’s playoffs because of their past failures. So yes, the clock is ticking. Steven Abramo: Philadelphia’s ascension to the top of the East has been impressive this year. 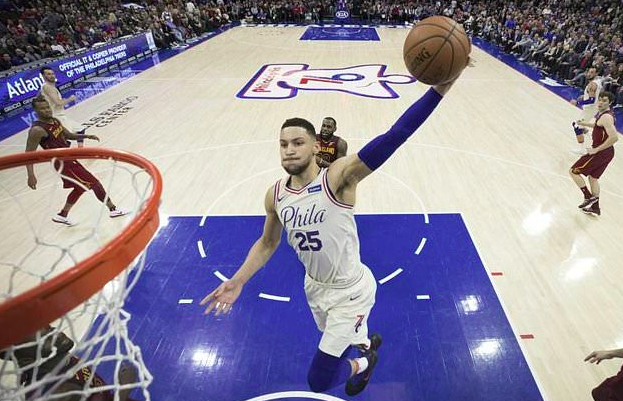 The growth of Ben Simmons, the dominance of Joel Embiid (when healthy), plus the leadership of JJ Redick has captured Sixers’ fans hearts. They’ve clearly exceeded expectations, winning 51 games (the most since 2001-02), entering the playoffs as the No. 3 seed. How much fear should they put into the rest of the East playoff field? Jerome Williams: In my opinion, this team is the only real threat in the East to beat Cleveland. Everything seems to be clicking at the right time, however, what stands in their way from making a deep run is health. Embiid has been fantastic this season, but he’s currently on the shelf with an injury. If he is limited in his return, advancing in the playoffs becomes exponentially more difficult. If there’s a silver lining its that Embiid’s latest injury is to his face and not his lower extremities so he should be able to play through it. It’s clear that they’re peaking at the right time, but they’re also very young. Besides Redick and Amir Johnson, I’m not sure Philly has much playoff experience on its roster. The games are more physical and quicker in the playoffs, and the Sixers will have to grow up quick to make a deep run. Sam Hengeli: They should put a lot of fear into the Eastern Conference. Right now, they’re the hottest team in basketball. Embiid and Simmons, mentally and physically, has provided them with an edge on the court this year. Plus, Markelle Fultz’s emergence provides the Sixers with another strong penetrator and offensive weapon. Their path to the conference finals starts with the Dion Waiters-less Miami Heat and the Kyrie Irving-less Celtics, so it’s very manageable. They have a legit shot to reach the Finals, however, that all depends on steady contributions from Redick, Robert Covington, and Dario Saric. Steven Abramo: We’ve talked about Philadelphia and Toronto, and it appears we’ve saved the biggest storyline in these playoffs for last. This is of course about LeBron James. There’s no hiding it. The 15-year-pro has shown no signs of aging, in fact, he’s outperforming his age limits, once again. This year’s Cavaliers haven’t experienced the smoothest of seasons, losing Kevin Love for an extended period, while also playing with two different rosters before and after the historic Isaiah Thomas trade. Cleveland will enter the playoffs as the East’s No. 4 seed, what do they have to do to reach the Finals for a fourth consecutive year? Jerome Williams: There’s no doubt that Cleveland sputtered big time during the regular season. Before the trade deadline, there was a lot of talk about blowing up the roster. Well, they did! Since then, the Cavs have looked like an entirely different team. They enter the playoffs winning 11 out of 14 (with two wins against Toronto). George Hill hasn’t been as productive as the past, but Jordan Clarkson has more than made up for Hill’s shortcomings. Between the two, they’ve been a net positive on the floor for Cleveland. But another deadline acquisition, Larry Nance Jr., has shored up two of Cleveland’s glaring weaknesses: defense and rebounding. Also, Kevin Love is healthy again, and LeBron is playing the best basketball…maybe ever. I think making it out of the East is an afterthought for the Cavs; the real challenge will come in the Finals. The question then becomes, can LeBron’s greatness lead the Cavs past Houston or Golden State? I’m betting no, but I think a finals showdown with either of those teams will be closer than people think. Sam Hengeli: There are four keys the Cavs need to do to make it back to the Finals. First, they need to able to defend well enough throughout every series. As you hopefully all know, staying locked in defensively was a serious issue for Cleveland during last year’s playoffs. This season, much is the same, ranking 26th, 27th, and 29th, respectively, in points per game allowed, defensive field goal percentage, and defensive efficiency. Another key is to receive more production out of Love. He’s averaging a respectable 17.6 points and 9.3 rebounds per game, however, they may need a 20 and 10 type performance nightly to compliment LeBron. The third key is the ability to rebound. Crashing the glass was an area of concern for Cleveland this year, finishing 17th in defensive, and 29th in offensive rebounding rate. The battle in second-chance points will be critical each game. Lastly, the Cavs need to get the most out of EVERYONE. We all know LeBron is going to dominate, but the supporting cast of Clarkson, Nance Jr., Rodney Hood, and J.R. Smith are all vital to Cleveland’s postseason success. I’d take it a step further and say no playoff experience form, Nance, Clarkson, and Hood might make or break the Cavs.